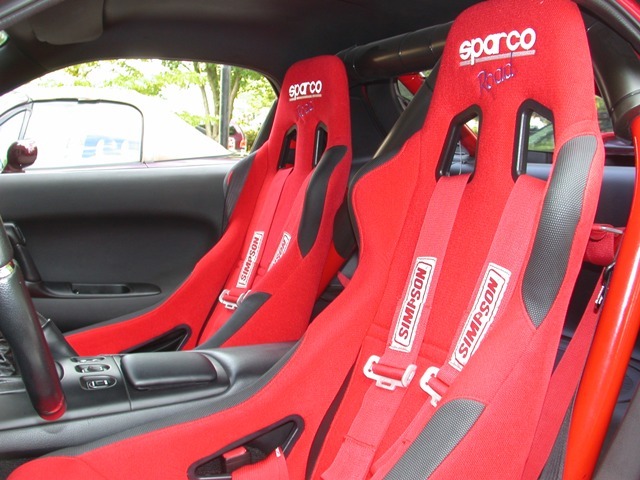 Sparco "Road" Racing Seats installed. This is one of those instances that, dare I say it, was an impulse buy. 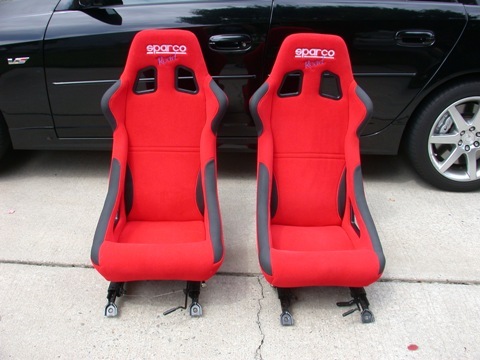 It's not everyday that a matching pair of virtually new racing seats, that fit the FD without rubbing the door, that don't need modification of custom fabricated seat rails, and that are being sold as used and therefore relatively inexpensive. So I bought these for a decent price. Why? For a street car? Well a couple of things to consider, they look nice, they will aid greatly in driver performance on the track, they look nice, they are safer on the track that a street seat, oh, and they look nice. 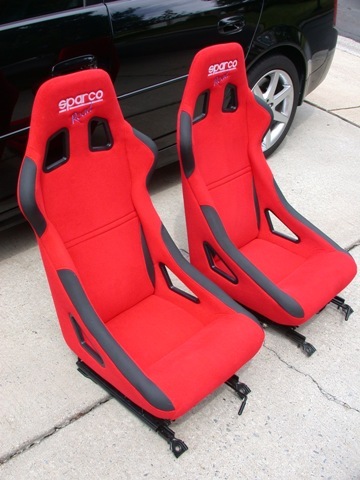 But seriously the difference in driver comfort and feel between a race seat and an OEM seat is night and day. These are a bit snug on my 5'9" 200lb frame but I was not uncomfortable after a 4 hour drive to the 2009 Carlisi BarBQue at Gordon Monson's place in PA. So for now they stay and my mint condition "suede" R1 buckets are bagged and stored away for later use if need be. Installation was almost too easy. Based on some of the stuff I've done in the past this was a piece of cake on a warm fall afternoon. 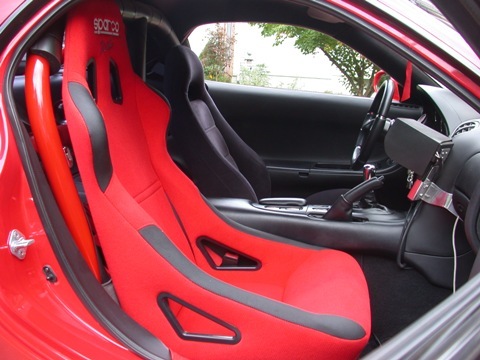 See the seats came directly out of another FD RX7 so came fitted with custom made seat rails already. All I had to do was bolt them in. And bolt them in I did. The rails are actually modified OEM rails whcih makes the seats sit up rather high and at an angle I'm not too happy with, but can live with, but that can be easily rectified later. 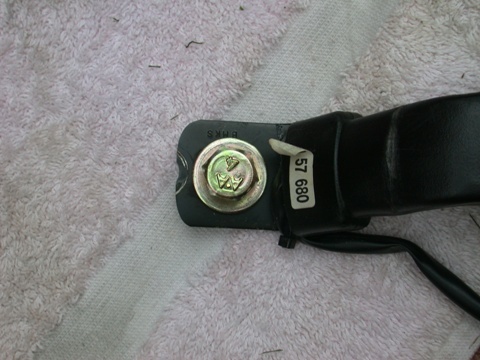 The only drawback as setup was no provision for the OEM 3 point belts. Now I have 5 point harnesses but they aren't meant for street use nor are they techcnially legal so I wanted to make sure the OEM belts would work. 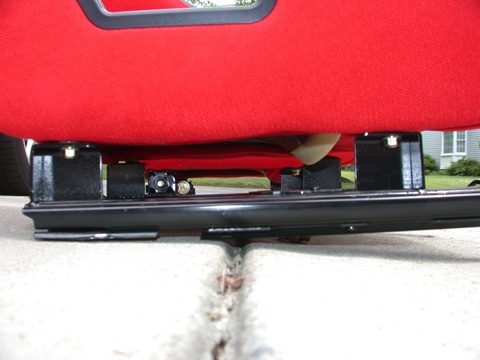 Since the OEM sliders were used this was almost as easy as unbolted the belt latch from from R1 seats and bolting them to the Sparco seat rails. Ah but not quite. I had to shorten the bolting bracket to get them to fit but they are no less structurally sound that the originals - see images below. 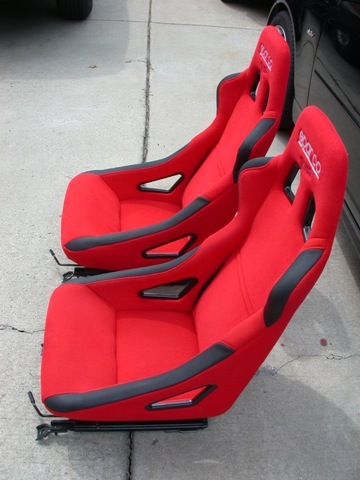 New pair of Racing seats. 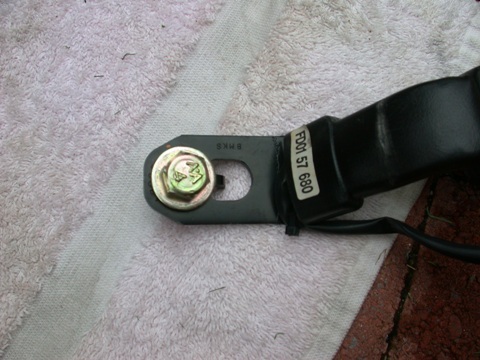 The OEM seat belt latch mounting configuration. 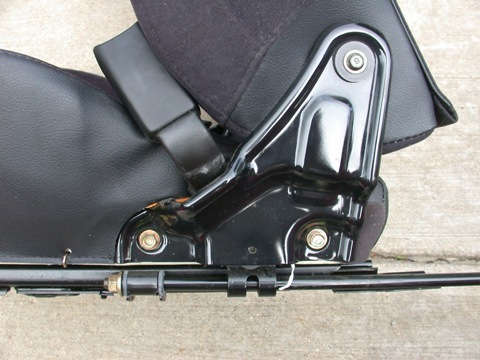 The before and after seat latch bracket. Basically just shortened with the new bolt placement through the prexisting hole. 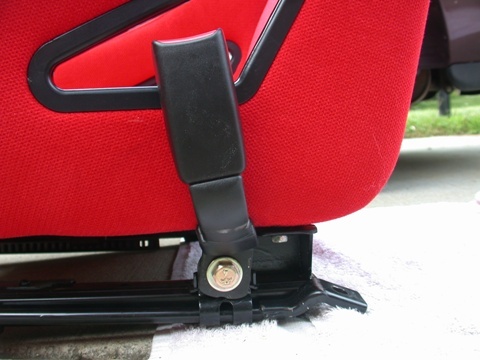 The OEM seat belt latch fitted to the modified Sparco rails. 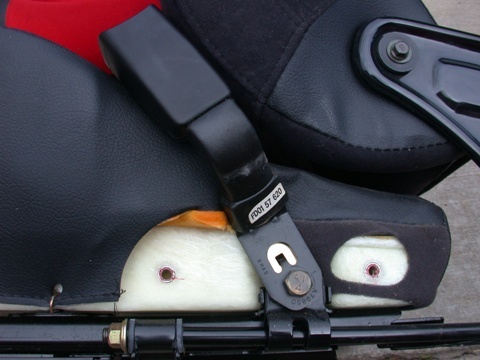 The modified seat brackets nicely bolted in place. Test fitting the passenger side first. All fit well and you can see plenty of room between "wing" and door. 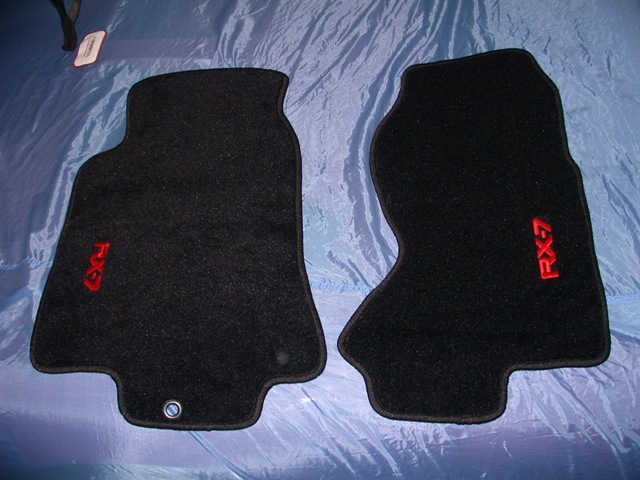 Since I was redoing some of the interior with new seats I felt it an opportune time to replace my floor mats. 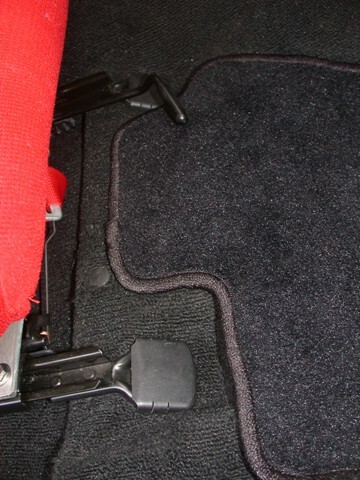 Now my mats were in pretty good shape with only a small bit of wear right at the drivers right heel. But these were affordable and of very good quality at a price significantly less that OEM replacements. So I ordered a pair with nice matching red lettering. BLING! I've always hated the fact that my car has an ashtray. It was not very useful for storing stuff and what was in it always slid out fo reach. 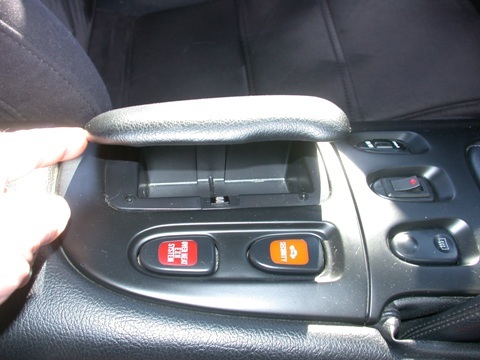 The Japanese cars had an optional change holder that fits into the ashtray recess. So I splurged and bought one. It very hadny even if the lid opens in the "wrong" direction. 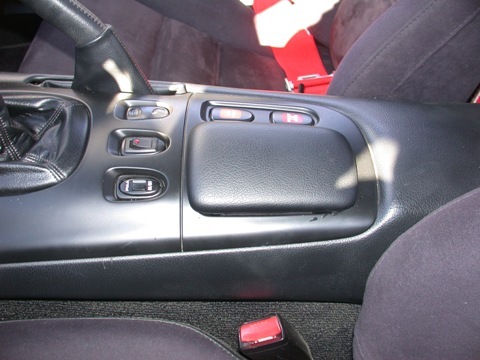 Handy dandy OEM change pocket.